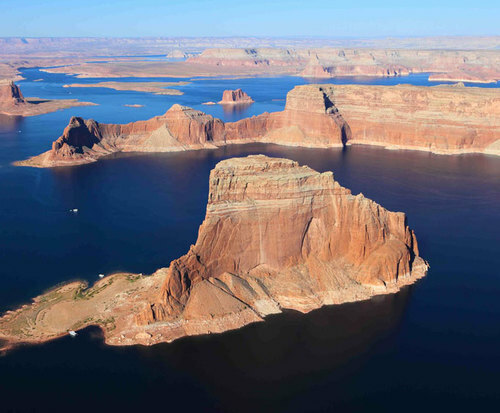 Take in the vast beauty of Lake Powell and see famous and historic landmarks like Gunsight Bay, Moenkopi Formation, Kayenta Sandstone, and so many more while you learn about each landmark from a professional and friendly guide! Departing from Wahweap Marina, this amazing tour will take you around the lake and show you all of the hidden wonders, as well as the sights that aren't so hidden, and give you educational insight on the formation and histories of each place you cruise by. You will hear geological tidbits about the lake and shores, as well as informational fun facts about the wildlife and plant life that call the lake and the surrounding area their home. Be sure to bring your camera and an extra roll of film or memory card to capture all of the breathtaking scenery you are guaranteed to see on this amazing boat tour! 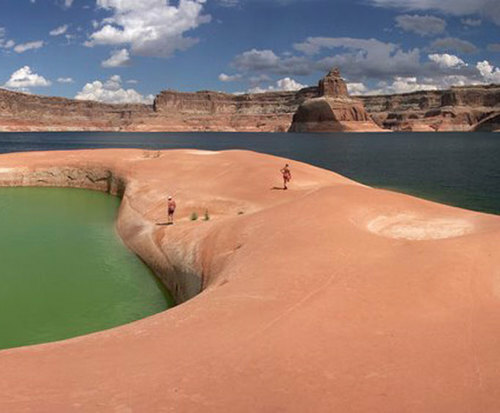 Lake Powell is the second-largest man-made lake in the United States and attracts nearly 2 million people annually to take in it's natural beauty and scenery, from the glisten of the water to the numerous natural formations and landmarks that line the shores. The lake was originally created by the flooding of Glen Canyon Dam and was named after John Wesley Powell, a one-armed explorer that served time in the American Civil War. 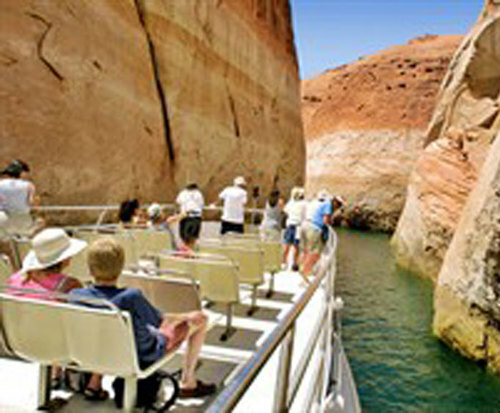 Some of the scenic and breathtaking landmarks you will see throughout your boat tour include The Moenkopi Formation that dates back 230 million years, the Chinle Formation, Windgate Sandstone, the Rainbow Bridge that serves as one of the world's largest natural bridges, the Entrada Formations, Carmel Dormaton, and the only bridge spanning Lake Powell, the Hite Crossing Bridge. You will also see Kayenta Sandstone that produces the trademark bluish-black varnish that streaks the canyon walls, among other amazing natural formations. This is the perfect addition to any vacation or getaway in the area, so make this boat tour one of the highlights on your list!